Historically, indications of eventual NCLEX success or failure have been restricted to end of program assessments like our own ATI Comprehensive Predictor. Although a highly predictive instrument that provides individualized recommendations for student remediation, the Comprehensive Predictor is not designed to dynamically follow a student through his or her academic career and inform of potential NCLEX remediation needs. To address this gap and provide earlier indications of remediation needs, ATI conducted a national study to determine whether performance on ATI’s products (other than the Comprehensive Predictor) might be used to provide students and faculty with earlier indicators of “at risk” status. 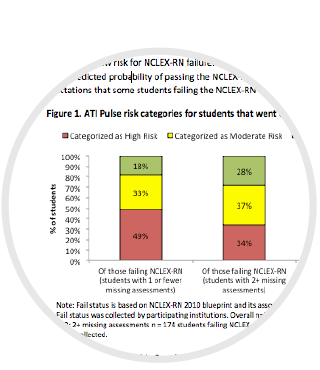 The result of ATI’s national-level analysis was the creation of the predictive model: ATI Pulse, which is capable of identifying students who are at risk of NCLEX failure both early and throughout their nursing program of studies. ATI Pulse categorizes students by risk factor including “On Track, Needs Improvement and At Risk” while providing trending visibility. Pulse also provides a view on anticipated cohort level performance with both current and historical views. ATI Pulse categorizes students by risk categories and identifies those students who need the most remediation assistance. This provides students and schools with the time they need to improve scores and ultimately increase NCLEX pass rates. ATI Pulse provides comprehensive and detailed views of student and cohort product usage as compared to ATI recommended product usage benchmarks. This can help guide remediation, product policy creation and policy enforcement. Results of ATI’s large scale analysis expand upon similar, program-level, efforts exploring how ATI products are predictive of later NCLEX-RN performance. 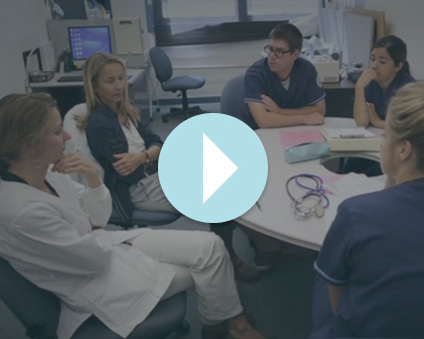 Predicting NCLEX success for schools and students. Historically, indications of eventual NCLEX success or failure have been restricted to end-of-program predictive assessments. These assessments are an important part of measuring student readiness, they’re not designed to provide an ongoing evaluation of a student’s readiness at different points in their academic career and pinpoint their remediation needs. To address this gap and create a dynamic indicator of NCLEX readiness and remediation needs, ATI analyzed the data of more 76,602 students in PN, ADN, and RN programs across the country. You can read how ATI developed the Pulse predictive model in this research brief.